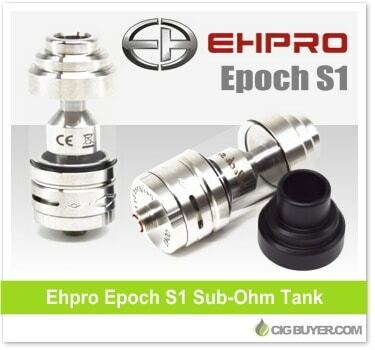 Following the release of the Ehpro SPD A5 temperature controlled mod, Ehpro is offering a new sub-ohm tank with pre-built temp control coils – the Ehpro Epoch S1 Sub-Ohm Tank. Not only can you choose from 0.2 ohm (nickel) and 0.5 ohm (kanthal) coil heads made with organic cotton, but it also comes with rebuildable head for your own custom builds. This quality rebuildable tank is constructed of 304 stainless steel with a 3.5ml pyrex glass tank and includes a copper center pin with large adjustable air slots for exceptional airflow.